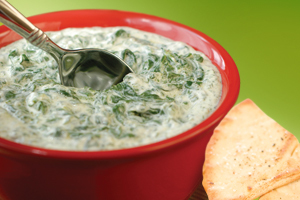 Try this hot, cheesy dip with pita chips, crackers or bread. In a food processor blend onion, garlic, pepper, cottage cheese, milk, ¼ cup of mozzarella cheese, ¼ cup parmesan cheese, and mayonnaise. Add the spinach and artichoke hearts and pulse until gently incorporated. Pour into a greased 8×8 baking dish. Top with remaining cheese. Bake 350F for 20-30 minutes. Serve with pita chips, crackers or bread.